Despite its laugh-inducing title, The Thing from Another World (1951) turned out to be such a taut, well-made film that even people not enamored of science fiction admit that it's a classic. At the time of the film's release the New York Times wrote: "Not since Dr. Frankenstein wrought his mechanical monster has the screen had such a good time dabbling in scientific fiction....the film is full of unexpected thrills" and audiences were in total agreement. Contemporary film writers Bill Warren (Keep Watching the Skies) and Tom Weaver (Universal Horrors) both consider it one of the ten best science fiction films ever, and they're hardly alone in their assessment. The film begins as Air Force Captain Hendry (Kenneth Tobey) and his crew head to the Arctic to investigate reports of a mysterious aircraft that crashed there. Upon arrival, he discovers a scientific expedition already encamped there and close to locating the crash site. Hendry also encounters his former girlfriend, Nikki (Margaret Sheridan), who is working for the scientists as a secretary. Soon the group uncovers the alien aircraft buried in the ice and once they melt through to the wreckage, the situation quickly escalates from unpredictable to terrifying. 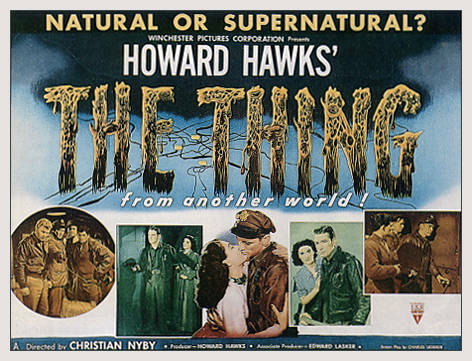 Undoubtedly the most famous controversy over The Thing is whether Howard Hawks - listed here as a producer - actually directed most of the film instead of the credited director, Christian Nyby. In an interview with Peter Bogdanovich for his book, Who the Devil Made It? (Ballantine Books), Hawks commented on the mystery: "Chris Nyby had done an awfully good job as the cutter on Red River and he'd been a big help to us too, so I let him do it. He wanted to be a director and I had a deal with RKO that allowed me to do that. I was at rehearsals and helped them with the overlapping dialogue - but I thought Chris did a good job." Nevertheless, a few people on the set later claimed that Hawks did much of the daily directing and there are even photos that tend to support this. It's also clear that The Thing shares strong similarities with other Hawks films that deal with group dynamics, particularly in situations where everyone, women included, are working under pressure and are being judged by their performance. Take a look at any Howard Hawks movie, from Only Angels Have Wings (1939) to Air Force (1943) to Hatari! (1962), and it's remarkable how many of his films fit this pattern, including The Thing. As for credited director Christian Nyby, who had previously won an Oscar for his editing of Red River (1948), it would be another six years before he would helm another picture - Hell on Devil's Island (1957). But enough about the true director of The Thing. The film was based on a story by John W. Campbell, Jr., who was one of the key figures in the development of science fiction: he worked as the editor of Astounding (which later became Analog) for almost four decades and helped launch the careers of Robert Heinlein, Arthur C. Clarke, Isaac Asimov, and numerous other writers. Interestingly, Campbell's own story "Who Goes There?," first published in 1938 under the pseudonym Don Stuart, was decidedly more paranoid than the 1951 film version of The Thing. For the screenplay, scenarist Charles Lederer actually discarded most of the original story except for the basic premise. He even changed the basic physical nature of the alien (in the story it's a shape-shifter). By the time The Thing was ready for filming, several gruesome sequences had already been trimmed from the script such as a human decapitation scene. Several stories have circulated about some of the various uncredited writers on The Thing. Ben Hecht and William Faulkner are often mentioned as possible contributors, which makes sense since they both worked at various times with Hawks and were around RKO Studios during that time. Another rumor that is almost certainly untrue is that Orson Welles contributed some dialogue to the screenplay. Filming on The Thing started on October 25, 1950, at RKO soundstages (one of which had been used for Citizen Kane, 1941) with an A-level budget set at $1.3 million (later to increase to $1.6 million). By the end of November the cast and crew went to a large icehouse in downtown Los Angeles to film shots where the actors' breath needed to be visible in the cold. Then it was off to Montana where they intended to film the expedition and saucer exteriors. Unfortunately the producers didn't realize that the snow in that part of Montana wasn't really adequate for their needs so they only got a few shots there. Additional shooting was done on a North Dakota set using stand-ins for the actors. The flying saucer sequence ended up being filmed at the RKO Ranch in Encino, California, using fake snow in front of an extensive curved backdrop. In regard to the music score, The Thing is one of the earliest science fiction films to use a theremin, an electronic instrument played without touching it. The theremin's eerie whine had earlier been used in thrillers like Spellbound (1945) and The Lost Weekend (1945), but henceforth it would be associated primarily with horror and science fiction thrillers. James Arness, later famous as Sheriff Dillon on TV's Gunsmoke, was cast as The Thing and at the time he was just a struggling movie actor. In his few brief appearances as the creature, it's difficult to get a very good look at him; apparently a lot of close-ups were filmed but most were later removed because they were too obviously fake. As documented, Arness reported to the set two months prior to filming for the development of the make-up design, which took two hours each day to apply. At least their efforts weren't in vain: One day Arness and the make-up man took the Thing's claws to a drive-in restaurant where they startled the unsuspecting waitresses. Yet, despite the film's subsequent success, Arness was reportedly embarassed by his role as The Thing for the rest of his life and didn't even attend the film's premiere. In 1982, John Carpenter remade The Thing, but this time remained more faithful to Campbell's original story. Though dismissed at the time, Carpenter's version is now considered a neglected masterpiece. Unsettling and paranoid, it's one of the few genuinely surrealist films ever made. But the original version of The Thing is also a landmark film in many ways and says much about the psychological state of the nation in the fifties when flying saucers were a popular topic as well as a threat. Cast: Kenneth Tobey (Capt. Patrick Hendry), Margaret Sheridan (Dr. Nikki Nicholson), Robert Cornthwaite (Dr. Arthur Carrington), Douglas Spencer (Ned "Scotty" Scott), Dewey Martin (Bob), Eduard Franz (Dr. Stern), Robert Nichols (Lt. McPherson), James Arness (The Thing). BW-87m. A giant vegetable from outer space crash-lands his flying saucer at the North Pole, and by the time the military shows up, he's hungry. Actually the military is cautious about dealing with The Thing, as Kenneth Tobey plays the Air Force Captain who's trying to rein in crazed Darwinian scientist Robert Cornthwaite, who's fascinated by the creature's ability to devour everything. The cast finally zaps him with some old-fashioned AC current, but the surviving journalist shouts "Keep Watching the Skies!" Written by Charles Lederer. Based on "Who Goes There?" by John W. Campbell Jr.
� 2001 Joe Bob Briggs. All Rights Reserved. Not an AOL Time-Warner Company in this lifetime. Dr. Arthur Carrington: There are no enemies in science, only phenomena to be studied. Lt. McPherson: I wonder if this thing can read minds. Eddie: Well, if it can, it's gonna be real mad when it gets to me. Ned "Scotty" Scott: Think of what it means to the world! Hendry: I'm not working for the world. I'm working for the Air Force. * It is generally believed that Hawks, Howard took over direction during production, and it has always been acknowledged by director Christian Nyby that Hawks was the guiding hand. Partly filmed in Glacier National Park and at a Los Angeles ice storage plant. * This film was based on the short story "Who Goes There?" by Don A. Stuart. The credits on this film list the author by his real name, the science fiction editor/writer John W. Campbell, Jr.
* Midget actor Billy Curtis played the smaller version of "The Thing" during the creature's final scene. * James Arness complained that his "Thing" costume made him look like a giant carrot. * Howard Hawks asked the US Air Force for assistance in making the film. But he was refused because the top brass felt that such co-operation would compromise the official stance that UFOs didn't exist. * Only technical and production credits precede the film, no acting credits. Clark: I dunno what the hell's in there, but it's weird and pissed off whatever it is. MacReady (Kurt Russell) Why don't we just wait here for a while... see what happens. Childs: You're gonna have to sleep sometime, MacCready. MacReady: I'm a real light sleeper, Childs. MacReady: I dunno, it's like this: thousands of years ago this spaceship crashes, and this thing, whatever it is, jumps out or crawls out and gets entombed in the ice. MacReady: That's right, Garry. They dig it up, they cart it back to their base. Somehow it gets thawed, it wakes up, probably not the best of moods, and... I don't know, I wasn't there! * The film was originally banned when released in Finland. * The original movie took place at the North Pole, this version takes place at the South Pole. * Donald Pleasence was the original choice for the character of Blair. Pleasence was unable to perform the role due to a scheduling conflict. * At the beginning of the film the Norwegian with the rifle screams in Norwegian: "Get out of the way! It's not a dog, it's some kind of a thing, it's imitating a dog. Get away you idiots!" The Norwegian dog in the film was named Jed. He was a half wolf/half husky breed. Jed was very obedient, never barked and acted perfectly on cue for his scenes. * To give the illusion of icy Antarctic conditions, interior sets on the Los Angeles sound stages were refrigerated down to 40 F while it hovered around 90 F hot outside. * There are no female characters in the film. The only female presence in the movie is in the voice of MacReady's chess computer and the contestants seen on the game show that Palmer watches. A scene containing a blow-up doll was filmed and then left on the cutting room floor. Additionally, one of the crew was a woman but she fell ill during the outdoor shoot and was replaced with a man. * For a scene where a character's arms are severed, a real-life double amputee stand-in was used wearing a mask in the likeness of the character. The audience focuses on the bloody stumps while the mask goes unnoticed. * In the close up shot of the United States National Science Institute Station 4 sign, a 'Smokey the Bear' sign can be seen. * In the scene where Norris' (Charles Hallahan) head separates from his body, special-FX designer Rob Bottin used highly inflammable materials for the construction of interior of the head and neck models. During the shoot John Carpenter decided that, for continuity reasons, they needed some flames around the scene. Without thinking they lit a fire bar and the whole room, which by now was filled with inflammable gasses, caught fire. Nobody got hurt, but the entire special effects model, on which Bottin had worked several months, was destroyed. * The Norwegian camp scenes were actually the charred remains of the American site from the end of the film. Rather than go to the expense of building and burning down another camp, Carpenter re-used the destroyed American camp. * To create the effect of the title being burned onto the screen in the opening scene, an animation cell with "The Thing" written on it was placed behind a fish tank filled with smoke that was covered with a plastic garbage bag. The garbage bag was ignited, creating the effect of the title burning onto the screen. * SPOILER: Kurt Russell was almost injured in the scene where he blows up Palmer with a stick of dynamite. Apparently, he had no idea exactly how big of an explosion it would produce, and the reaction that he has in the movie is genuine. * SPOILER: Nauls' death was originally filmed with him being attacked by a "Box Blair" creature. John Carpenter was unsatisfied with the effect and left Nauls's death ambiguous. * This was based on the classic short story "Who Goes There?" by Don A. Stuart. The credits on this film list the author by his real name, the acclaimed science fiction editor/writer John W. Campbell, Jr.
* This film is considered a benchmark in the field of special makeup effects. These effects were created by Rob Bottin, who was only 22 when he started the project. * A number of sources have indicated the existence of a 127 minute version. The initial home video releases (MCA Home Video) also listed the 127 minute version on the box but the tape itself contained the 109 minute version. * The main title was meant to recreate the look of the main title of the original version, The Thing from Another World. * This is the first of Carpenter's films which he did not score himself. The film's original choice of composer was Jerry Goldsmith, but he passed to do Poltergeist (1982) instead.